Tag Heuer watches have become synonymous with style and high-end quality and the Tag Heuer 300SLR –a tribute to Mercedes Benz– timepiece proves that the watch manufacturer continues their practice of creating timeless pieces that look good on anyone while keeping up with the latest in timepiece technology. 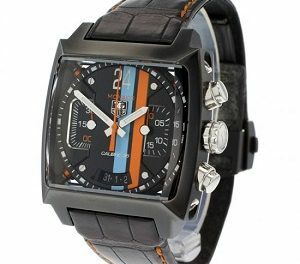 On this particular watch, Tag Heuer included something even more impressive on this limited edition watch an engraved design of the actual traditional mercedes 300 slr is “kind of sculptured” on the back. This is the third version already created for the limited edition “Mercedes Benz series”. All models are very different form the other and that is obviously a good thing for the collectors. Rather than the standard silver or gold dials, Tag Heuer has created an orange second hand that stands out against the brown dial. This is a nice touch on an already classy looking watch. The double anti-reflective treatment makes reading the watch easy in bright environments. If you should ever forget to take your watch off while swimming or showering, it is water resistant for up to one-hundred meters so you do not have to worry about your watch being damaged or ruined. The luminescent faceted hands and indexes provide greater visibility either in the dark or under water. Most people fear that their watches will eventually scratch and get ruined, but this watch has an anti-scratch curved sapphire crystal that is cut from what’s known as polished slice of sapphire (solid) which is so durable that only a diamond can scratch it. The straps of this watch are available in fabric and leather in addition to alligator or python skin—not an option you typically find on a watch. 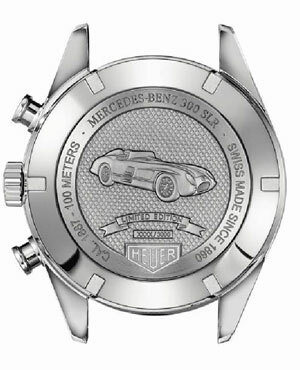 Finally, what makes this watch unique is the engraved mythical Mercedes-Benz 300SLR driven by Fangio that is engraved on the back of it.